When one thinks about India probably the last thing that comes to mind is Heavy Metal music. However, Bangalore, India has now turned out one of there very own Metal bands which is worth writing home about. Trying to describe the genre style of Slain can be quite a challenge due to the many styles represented in the band's arrangements. The tracks move from Power Metal to Progressive movements to Symphonic touches to Jazz & Blues infusions, to Folk Metal, and even to Jam band like sessions. Over all, even with all the above in consideration, the dominant genre that surfaces is that of Progressive Power Metal. In 2007 Slain stepped onto the Metal scene and in just one year-2008 released their 4-track EP simply titled 'Slain'. Then in 2009 the band moved forward as they released a second EP titled 'Before Beyond'. Both met with stellar reviews from fans and web'zines around the world. Then in 2010 the band entered the studios once again to record their magnum opus debut album ‘Here and Beyond’. 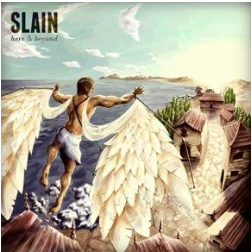 In 2010 Slain released their full-length debut album titled 'Here & Beyond' the entire recording, mixing and mastering process was produced at Xandrin Records, run by frontman Judah Sandhy. 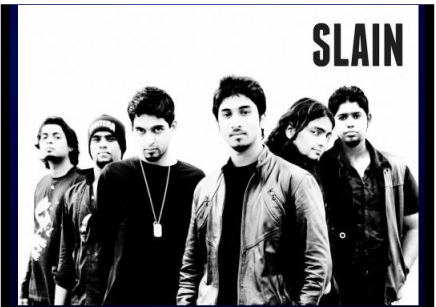 Slain had the following to say about the production of this 2010 release: "We’ve chosen to do everything ourselves- this time especially, because this album is our child, the product of 3 years of Slain. We like to think there's no one who could have raised it better. That’s the story of Here & Beyond." The cover art for the album was produced by Manek D’Silva and conveys the idea of Taking that risk, a leap of faith, and flying! This artwork reminds me of a moment in the movie 'The Last Crusade'where Indiana Jones is faced with a challenge where he has to step off the ledge with a leap of faith. Indy is given the clue in his journal that "Only in the leap from the lion's head will he prove his worth." The artwork shows that our faith is in One that we can not see and we must take a leap of faith and trust in the Lord Jesus. With such diversity throughout this release I'd like to try and convey a track by track breakdown as follows: Track one "The Dreamer" is a short dreamy introduction. Track 2 "Soldier" is a Symphonic Power Metal track with lots of energy which includes a short piano solo along with a Spanish style guitar solo. Track 3 "Your Majesty" is a straight up Progressive Metal tune which breaks off into a "jam band" instrumental section with some 70's style organ play thrown in along with some saxophone play. Track 4 "Superhero" starts out soft and Progresses into a heavier track with superb vocals from Judah Sandhy the sound is similar to artist from the 80's era with some sick guitar solos. Track 5 "Spread Your Wings" is a Blues infused Power Metal track loaded with energy and excellent guitar solos. Track 6 "Angel In The Sky" opens with some eastern influenced sounds coupled with orchestration and then moves into Progressive Power Metal with plenty of solos including Bluesy guitars and Organ play. This track closes out like it started, with more eastern influenced sounds. Track 7 "You Don't Have To Be a Star" opens with some Piano and is a progressive blues influenced tune with some acoustic guitar play along with some killer Electric Guitar shredn. Track 8 "Judgement Call" opens with an epic orchestration and then moves at break neck speed as the Power Metal hammer is brought down with symphonic touches lining the way. Track 9 "Prodigal is a Folk Power Metal tune with additional vocals from female vocalist Ruhee Ahamed. Within this track , Judah Sandhy & Ruhee go back and forth with a strong duet style performance. Track 10 "Here & Beyond" is 6 and a half minute of Epic Symphonic Power Metal madness where Judah Sandhy stretches his vocals to the next level. One thing I like about this release is that the band doesn't try and short change you in that most the tracks are in the 5-6 minute range in length. Vocalist Judah Sandhy does a stand up job for 'Slain' where we find that his delivery lies somewhere between that of Rane Cross(Crossrock), Jamie Rowe(Guardian) & Jon Bon Jovi. Yes, Sandhy has a very distinct vocal style ranging from clean to heavy/raspy and reminding one of the better days of Metal Vocalists from the 80's. One thing I appreciate about Sandhy is his ability to mix things up while stretching himself to different levels keeping each listen a fresh experience. The shred is brought to us by a duo guitar approach by guitarist Bryden Lewis & Guitarist Manek D’Silva. You might think to yourself that since this is a debut release that the guitar department is going to be some what lacking. However, the complete opposite is the case here as we find some top notch shredn going on from both Bryden & Manek. As mentioned above, we find everything from Power Metal riffs to Blues to Acoustic to general noodling. Also, for those who love solos, there are plenty of guitar solos to go around which in turn allows the tunes to breathe. On percussion, there's Bassist Naresh Nathan and on Drums Jared Sandhy who both do fine job for Slain. The keyboardist for the band is Jonathan Wesley who applies his signature touches throughout this project without coming across as too heavy. 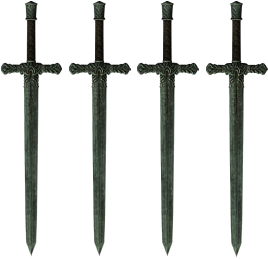 To show forth the light into the dark! And nail the enemy in his eyes! He wont bring you shame, there's power and light! You have always loved me. Why don't I realize the lamb was slain for me? And this is how I am and yet You chose to love me. Then how special can this love be to everyone? And heard the sound of my cry! And let them see Your majesty. If your looking to add more Power Metal to your collection then I highly recommend that you consider Slain as a top candidate. If you are into bands like Crossrock, Desyre, Harmony, or even Gloriam Dei then I believe you are going to love this killer release by Slain.